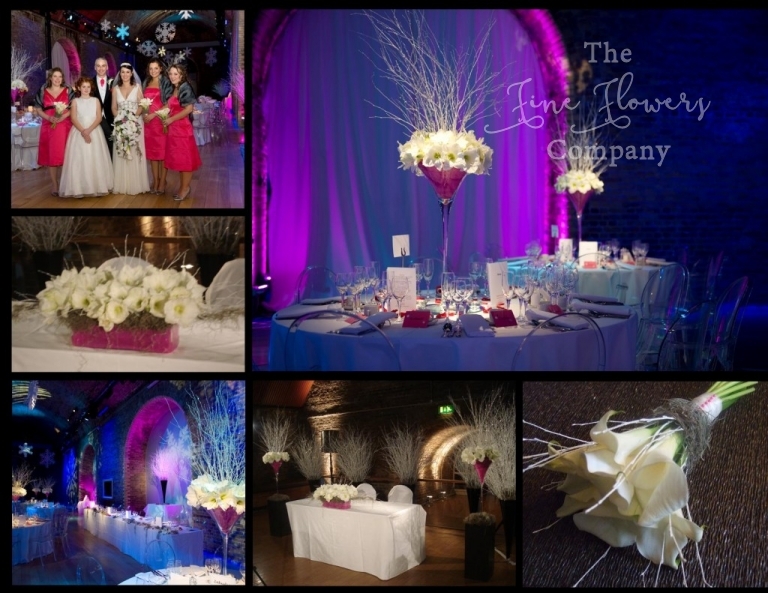 For this dramatic Vinopolis wedding wedding we created a really magical winter wonderland of icy white sparkly twigs and opulent amaryllis. My photos from this gorgeous Vinopolis wedding don’t really do this justice but luckily we have some professional photographers shots to make up for it. For this dramatic cool and icy winter Wonderland Vinopolis wedding we kept all centrepieces pure and white, relying on bold splashes of pink coming in from the bridesmaids dresses, table accessories and cool lighting effects to bring in dramatic splashes of colour. 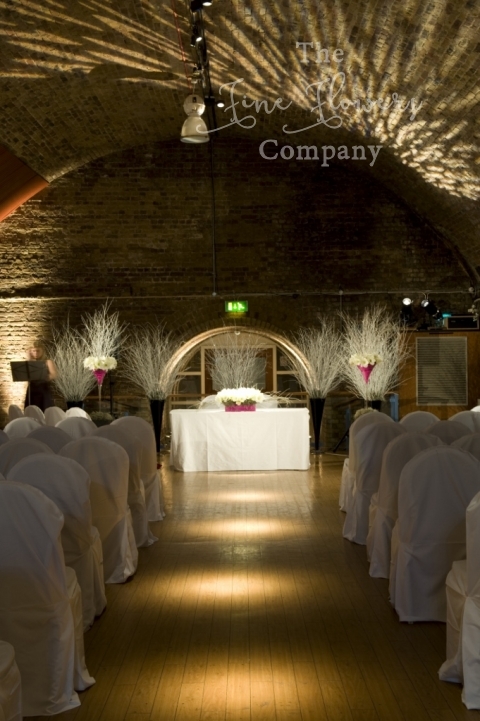 The Vinopolis wedding ceremony was held in one of the smaller vaulted rooms and dressed simply with a backdrop of tall modern black vases filled with tall sparkly twigs. The ceremony table was decorated with a modern long & low vase of white amaryllis with icelandic moss. The bride carried a very lavish shower bouquet of trailing phalaenopsis orchids and calla lilies and the bridesmaids carried handtied boquuets of modern calla lilies. 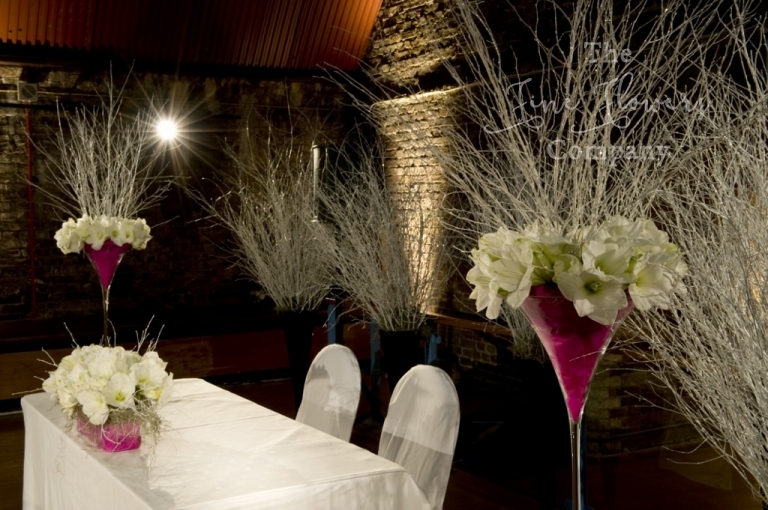 For the Vinopolis wedding reception, we dressed all guest tables with tall Martini vase centrepieces of pure white amaryllis and tall sparkly twigs and lined the vases with pink to pick up on the cool lighting accent colour. 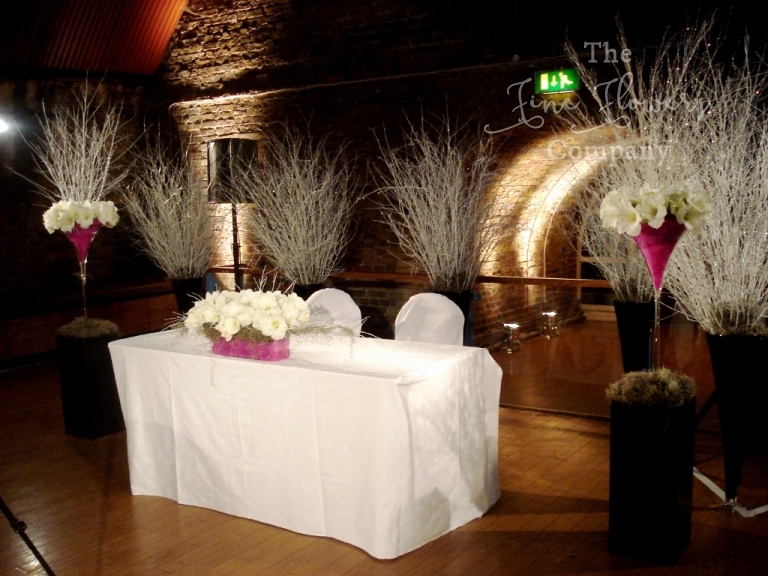 The top table was dressed with a long gaarland of amaryllis, sparkly twigs and silvery moss and the tall floor standing vases from the ceremony room were used to flank the wall arches. This unique Vinopolis wedding was a great example of how cool lighting can totally transform a venue! For special lighting at your wedding please visit Party Lights. Together with the huge snowflakes hanging from the ceiling, the flowers, lighting and the ceiling decorations created a fantastic Narnia effect for this gorgeous New Years Eve Vinopolis wedding. For other inspirational real wedding flowers photos please visit our gallery pages or search our blogposts by colour, theme or venue. In the meantime, please see more beautiful photos from this cool New Year’s Eve Vinopolis wedding.